In Canada, each province is responsible for specific licensing requirements for brokers. The province regulates and monitors the market to insure that fair and ethical practices are being followed by brokers. A life insurance broker is a particular type of broker who specializes only in life insurance. The life insurance industry is continually changing. This can complicate certain polices. A professional broker is a necessary resource when you are shopping for life insurance. Brokers are tasked with maintaining current knowledge about the latest policy offerings and industry trends. This knowledge is then passed to the customer, which allows them to be confident that all of their insurance needs are met. If you are shopping the insurance market to purchase life insurance, it is beneficial to work with an independent insurance broker for a number of reasons. The biggest reason being, a captive life insurance agent has a direct relationship with the insurance carrier, which means their interest is with the provider, not the life insurance buyer. A life insurance broker usually has no such contract with the insurance companies meaning that their interest is getting the client the best possible contract. Solutions Financial makes it easy! As consumers become more reliant on the internet to educate themselves on life insurance, life insurance brokers are forced to provide this information. 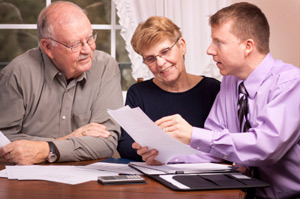 Solutions Financial prides itself in connecting Canadians with the best insurance advice. Solutions Financial is committed to getting you the best possible coverage at the best price. Get a quote today or contact us with any questions you might have.